For a 4 lbs (8 lbs when shipped) handheld leaf blower that comes with an 18 V lithium-ion, the RYOBI 18 V Cordless Hard-surface Blower can deliver air at an astonishing speed. To be precise: It can do so at 120 mph, enabling it to help you clear away debris from your property easily. This is made possible by its high-velocity nozzle, which concentrates the air it delivers. Since the handheld electric leaf blower itself is lightweight, using it will be quick, easy, and comfortable as well. The other useful features of the RYOBI 18 V Cordless Hard-surface Blower are: Dual power blower that ensures it will run for as long as possible, no cord to limit your reach, low emission levels, environment friendly design, and charger. Based on its design, it’s clear that the RYOBI 18 V Cordless Hard-surface Blower was intended for light work (e.g., clearing debris from patios, decks, and driveways), so don’t expect it to be effective in doing heavy-duty work. But rest assured it could do light work well. Some consumers have pointed out frequent recharging as a drawback to it, but most of the other consumers are satisfied with their models. Moreover, it has received an impressive rating of 4.6 out of 5 on Amazon with shipping will be free of charge. The Ryobi Ry40400 40 V Blower (battery and charger not included) weighs 2 lbs more than the handheld electric leaf blower reviewed previously, but you need not worry that being heavier could make it less comfortable to handle. In fact, you’ll need the added weight to keep it under your control during use. It delivers air at a maximum speed of 20 mph more than the handheld electric leaf blower reviewed previously, so you’ll need it to be heavier to stop it from flying off your hand during use. To ensure it will be safe to use, the Ryobi Ry40400 40 V Blower (Battery and Charger Not Included) comes with a variable speed trigger. This feature makes adjusting its power as easy as turning a switch, enabling you to power it down easily when it becomes too much for you to handle. When you need a bit more power, you may pull the trigger, which is placed conveniently on its handle. Having such a design makes it truly versatile. Like the handheld electric leaf blower reviewed previously, don’t expect the Ryobi Ry40400 40 V Blower (Battery and Charger Not Included) to be effective in doing heavy-duty work. If you don’t, you won’t have any problems with it. In fact: Not only are most consumers satisfied with their models; it has received a good rating of 4 stars out of 5 on Amazon with shipping will be free of charge. If you have a modest property that’s a bit larger than the other properties similar in size, the Ryobi P2170 ONE+ 150 mph 200 CFM 18-Volt Lithium-Ion Hybrid Cordless or Corded Blower/Sweeper (New in Retail Packaging) would be perfect for you. 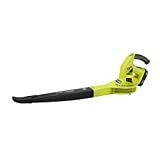 Although it delivers air at the same maximum speed as the handheld electric leaf blower reviewed previously, it delivers the most volume of air among several of the best RYOBI leaf blowers currently available in the market. The Ryobi P2170 ONE+ 150 mph 200 CFM 18-Volt Lithium-Ion Hybrid Cordless or Corded Blower/Sweeper (New in Retail Packaging) is also the most versatile handheld electric leaf blower on this list. Indeed, since it’s a hybrid, which means it runs on its battery or its extension cord, it can be used much longer than both of the handheld electric leaf blowers reviewed previously, making it a truly versatile outdoor power tool. Its other useful features include: lightweight design (a mere 5 lbs), which make maneuvering it a breeze; interchangeable nozzle connections, which make it even more versatile; electric start-up, which makes activation a snap; and charger. Like both of the handheld electric leaf blowers reviewed previously, the Ryobi Ry40400 40 V Blower (Battery and Charger Not Included) will be ineffective in doing heavy-duty work. Except for the “extreme aggressive whistling sound” that a consumer says it emits during use, you won’t have problems with using it. In fact: Not only are most of the consumers satisfied with their models; it has received a good rating of 3 and a half stars out 5 on Amazon; where it’s currently being sold with shipping will be free of charge. Hybrid technology is able to use any Ryobi 18V battery or an extension cord providing 120v 60hz input power and connecting to the standard 2 prong North American plug on the tool (extension cord – not included). This charger requires 120V 60HZ input power and has the standard 2 prong North American plug. If it would be ridiculous to think that pigs will eventually learn to fly, it would foolish to expect electric leaf blowers to be as powerful as gas leaf blowers. Each type of leaf blower was made for helping with a specific task. Gas leaf blowers are made for heavy-duty work. Electric leaf blowers are made for light work. Accept this and you’ll see how effective electric leaf blowers really are. Indeed, we trust any of the above reviewed RYOBI leaf blowers could make light work even easier. Go ahead and try them out for yourself. We assure you: You won’t be disappointed. Bought one of these a year or so ago. The impeller is cracked and Ryobi does not offer a replacement for this $5 part. They want me to buy another blower. Yeah. Not happening. Works ok as a sweeper, but not reliable. I would look elsewhere.